A two speed Europe refers to how, within the EU, economies are growing at different rates and are at different stages in the business cycle. For example, countries in the core of the Eurozone (Germany, Netherlands, France) have seen relatively good recovery since the recession. In these countries, unit labour costs have remained competitive, enabling a low current account deficit or even surplus. On the other hand, another group of European economies (you could refer to them as the PIGS – Portugal, Ireland, Greece and Spain) have seen slower growth, higher unemployment and a tendency to have a current account deficit. The problem of a two speed Europe is exacerbated by having a common monetary policy (same interest rate, same exchange rate and same policy on quantitative easing). This means it is difficult for economic policy to appease both different economic regions. 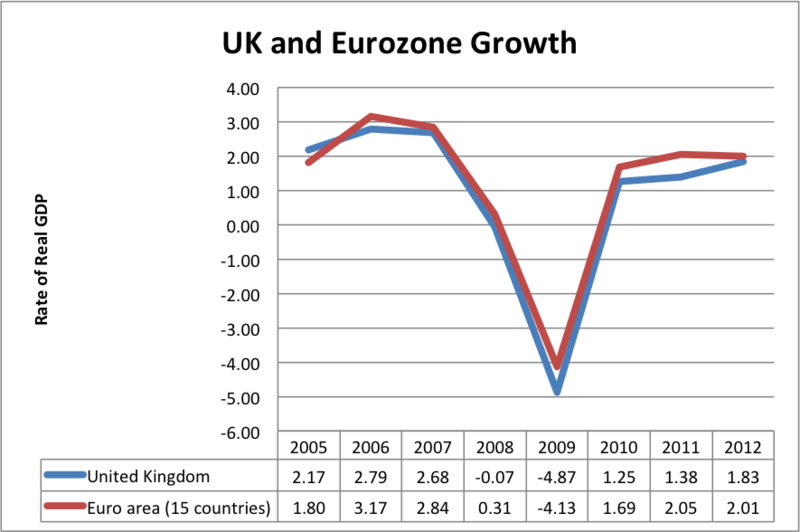 This graph shows that the UK’s economy has mirrored the average growth rate of the Eurozone closely between 2005 and 2012. However, it is worth bearing in mind that since 2007, the UK has pursued quite different economic policies to the Eurozone. Fiscal expansion, (at least until 2010) since when it has been reversed. I think it would be fair to say, the UK has managed to have the same growth as the Eurzone, precisely because it wasn’t in the Euro. The credit crunch hit the UK economy harder because of our exposure to financial sector but with greater flexibility we were able to reduce the depth of the recession. 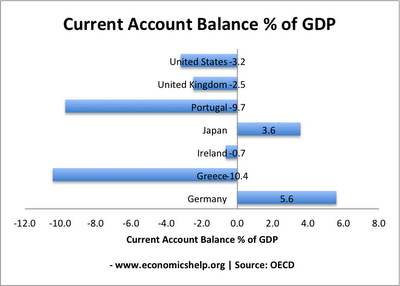 This shows that there is much greater divergence with a wider variety of economies. 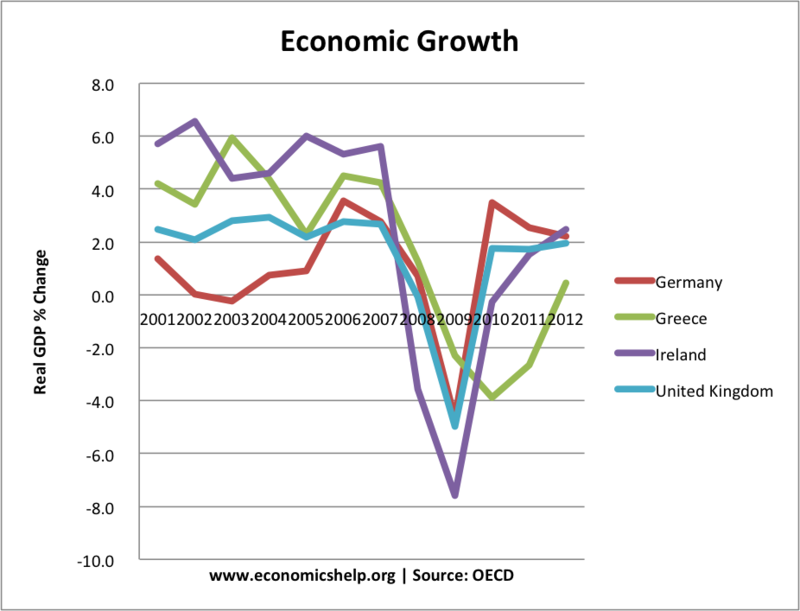 I took these statistics on growth forecasts from OECD site very recently. However, the forecasts for Irish growth look very optimistic given current state of Irish economy. 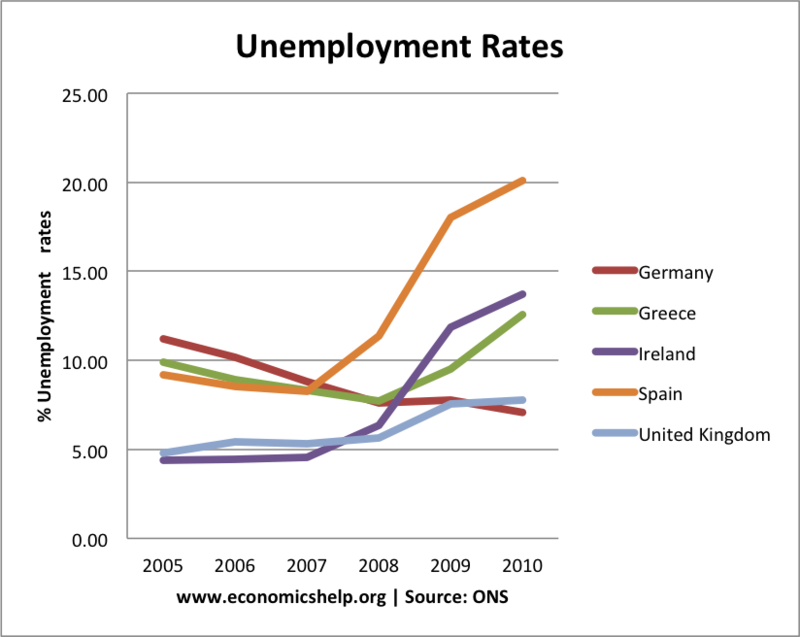 Looking at unemployment rates, the gap between different countries looks even more significant. Unemployment is one of the most pressing social problems (or should be if the ECB didn’t worry too much about inflation) This shows peripheral members of the EU like Spain, Greece and Ireland have a significant unemployment problem which has increased sharply since 2007. Yet, the ECB talks of inflationary concerns in Germany. This is the most concerning issue within the Eurozone. Peripheral members struggling because of spending cuts and overvalued exchange rates. Yet, there is little macro economic policies to help deal with this negative output gap. 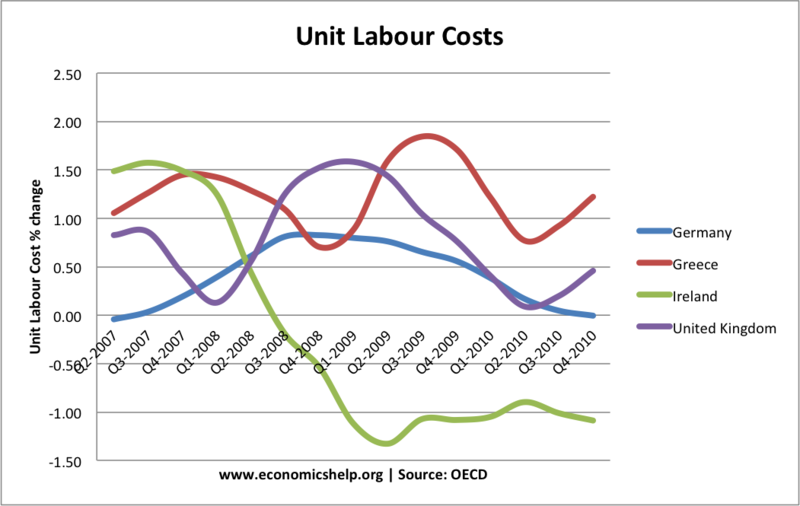 One reason (there are many others) for Greece’s difficulties is relatively rising unit labour costs. Also Interesting to see the squeeze placed on Irish wages since 2008, which perhaps explains why they were able to reduce current account deficit.